Request. This layout adds a Timmy type bass control to the TS808 (but with the lugs swapped round so bass increases as you turn clockwise) . 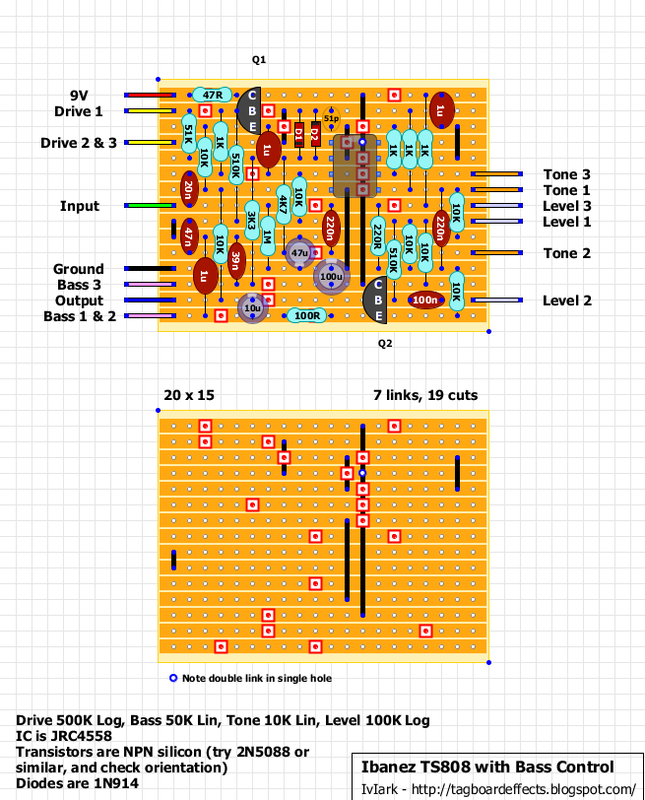 I could have just added this to the existing TS808 post but think it's worth separating them to show two distinct build options. I managed to shift things around so that the board ended up exactly the same size as the 3 knob version so there is no board size compromise if you prefer the extra tone control. It may be worth experimenting the the 220n and 220R filter at Tone 2 so the Bass and Tone pots compliment each other to your liking. And for those who really like the Timmy, this version uses both the Timmy Bass and Treble controls. Incidentally the taper in the Timmy was log but that won't work here as we're wiring it the opposite way, but anti-log would obviously give you the same sort of sweep you'd get in the Timmy (but the opposite way still of course). Or just stick to linear if you can't be bothered getting something in specially. And it's the 220n directly under pin 4 that may be worth socketing. Then a bit of experimentation with the interaction between the Bass and Tone pot and use the cap that ticks the boxes for you. Yep, just what I needed! Gonna do this with increased volume output and see if I like it better than the little green wonder. How would one add a separate mids control to this layout too? You could certainly add a mids control by having a low pass filter followed by a high pass filter which will allow you to set the upper and lower frequencies. It would be a bit more complicated though as I think you'd ideally want an active rather than passive filter. I'd want to test it out first to get the values fine tuned but I may add this when I get a chance to breadboard. That would be awesome, is there anything on this site like a tubescreamer or OD that has an independent mids control that you would recommend? Any word if this one is finally verified? Its such a great idea to have the added bass control. You can call this verified. Sounds like a TS808. Most of the bass is in the end of the taper, might benefit from a different taper here. Rev log perhaps? Or just play with the cap for a more efficient bass taper as Mark suggested. I used 2N3904 for the transistors so they are a little bit lower gain than the suggested 2n5088, will that affect the tone? Excellent thanks for verifying. The transistor type won't matter, it's just a unity gain buffer so I'd be very surprised if you could hear any difference at all. Yeah, that's what I thought. Thanks for confiming! Oh hells yeah. This is the best TS I've had. I'm done with straight up TS pedals, this is the one I'm keeping. Nice one, I like it when little circuit snippets from one pedal work well with other effects. Did another one-off based on this as it was ordered from me. Played around with stuff to get a little less compressed sound, more bottom end and volume boost. Swapped the 1K between IC pins 6 & 7 for a 2.7k, changed one of the clipping diodes to 1N4001 (swapping both for 1N4001's is better but the guy still wanted it to be tube screamerish and changed the chip for an LM833. Excellent sounding bluesdriver! Again, I'm not happy with the bass pot taper as the first half doesn't do anything. I'm gonna fix that in the next one if that comes. The bass control works perfectly with C50K. I was asked to do another one in a few weeks so I'll give it a go. The text is in portuguese (pt-br), but the idea is basically make a TS808 clone with 100Hz cut/boost (bass) and curve control (like the Way Huge Green Rhino) and a complete way to choose lots of clipping sets. It's unverified, but i hope chose between soft or hard clipping; 1, 2 or 3 diodes on the symmetrical key; and choose between six types of clipping diodes for each one, using a 2 pole 6 position rotary switch. Mark, do you know a good value tone pot to use to get a treble control with the same sweep as the bass control? 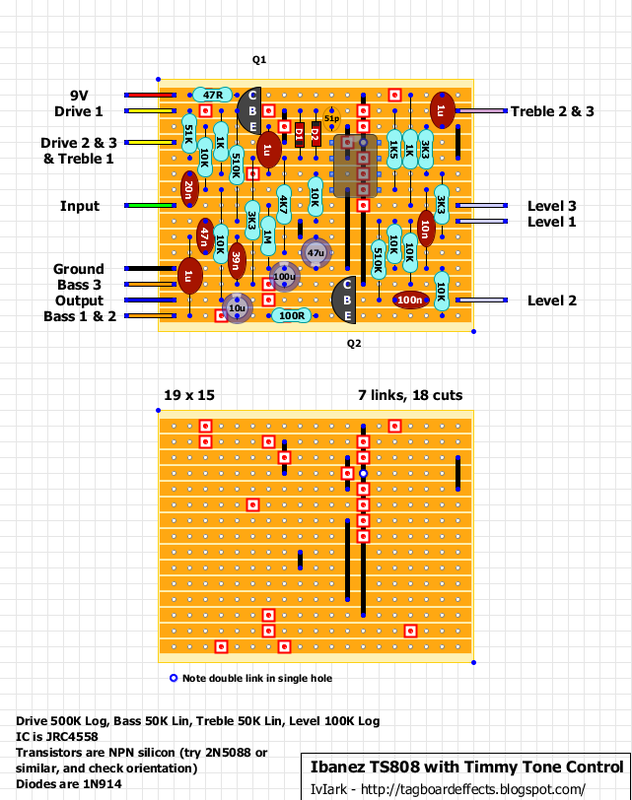 Experimenting with the 220R and 220n at Tone 2 will alter the frequency, or if you like the Timmy controls, you could build it with a Timmy treble pot instead of the conventional TS control, as in the new layout I just added. I built the version with the bass and treble control. Turns out that the treble control as listed is backwards. After reversing it and swapping out the linear pots for both bass and treble with reverse log versions for each, everything seems to be working well. Just built the first one with bass control. First time I built a pedal that worked perfectly on the first try :D Was verry thorough and checked everything 2 times before hooking it up. Great pedal!! If I wanted to add a diode selector switch to this, could I just put the diodes on a switch and wire it to where the diodes are on the board? I know I am looking for the moon on a stick here but is it possible to get a copy of the actual schematic? I should probably sit down and trace it myself but thought I would ask. I'm curious where the bass/treble controls are implemented in the signal path (pre/post clipping). In particular, would the bass control have a similar effect to the 100Hz control on the Way Huge Green Rhino Mkii? If I use an polarised cap for the 1uf on the bass control. Does it matter which way around it goes? Built one of the 'Timmy' ones this week and modified it for bass - replaced the 0.47nf for a 1µf (non polarised) and reduced the gain significantly by replacing the 51kΩ fixed resistor with a 5k6Ω fixed, and used a 47kΩ Log pot for the drive. Does anyone have schematics for both layouts? Would be much easier to see how the tone control is implented. I have a question! Why are both the ts808 filter (4,7K and 47nf) and the timmy filters (3,3k and 39nf+1uf) present in these circuits? Couldn't you just lose the TS filter? I just lifted the ts808 filter from it and it sounds better I think! I'm getting a pretty low volume on this one. Unity at 9 and only a slight boost at 10. Seems like less volume than other screamers. Any recommendations? I checked all pot values. So i built the one with timmy tone and bass and barely get a signal through. I noticed the first one has an extra cap under the ic? I ther is sound, the controls are responsive but its insanely quiet. Here is a newbie question. On the TS808 with bass layout image, is there a reason why the 51p capacitor is a different color than other other ceramic caps? Is it a regular ceramic cap? Basically no reason. You can use what type of capacitor you want. For most of us drawing the layouts, we're using "ceramic cap" image for values under 1n as those values are more commonly available as ceramic or MLCC - and those are more common to have 2,54mm pitch. Hey Mark, Do you happen to know what the JHS strong mod is for an 808? I have an 808, and my friend has a Bonsai, and the strong mod is by far the best one on that Bonsai. I'd love to do the mod myself, since I have a drawer full of parts. I made the one with the Timmy Bass and Treble controls and only at the end of the bass pot's travel does the bass come into effect. It's like 90% of the pot does nothing.